Give the gift of beautiful newborn images to expectant parents with this gift certificate. This gives the bearer an in-studio newborn session (2-4 hours). Prints, products and digital files are not included, but you can also purchase studio credit in any amount you choose to go along with the certificate. SKU: giftnewborn. Category: Gift certificates. Give the gift of beautiful newborn images to expectant parents. 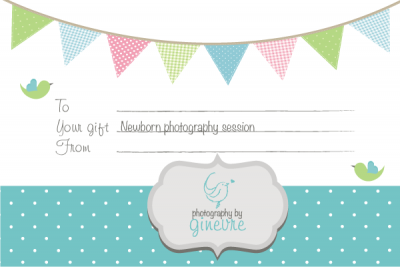 This gift certificate entitles the parents to a custom newborn session and $250 credit towards their order. You can purchase additional studio credit. Prints, digital files and wall art must be purchased separately and the studio credit will be deducted from the total order. Please tell us the name and email address of the person the gift credits are for at the time of purchase. They will be put into our studio management system and the credit added to their profile. We can also send you a gift certificate to give them!